There were a lot of surprised people on Saturday when Edmonton Oil Kings netminder Cam Lanigan didn't get picked up in the NHL Entry Draft. The Calgary product was ranked 9th in North America by NHL Central Scouting but did not hear his name called out although several goalies rated lower than he was did get selected. 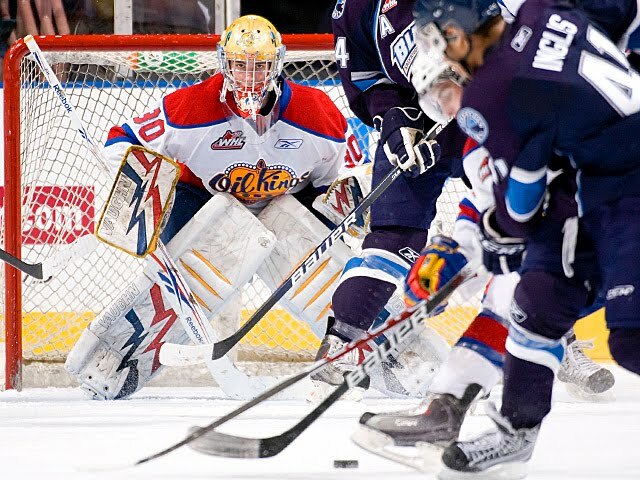 Some Oiler fans suggested that the Oil Kings netminder might be worth inviting to prospect camp for a closer look. The Pipeline Show has learned that Lanigan has indeed received an invite to a summer camp for a NHL team and that he will indeed be attending it. Next week the Edmonton Oilers will be holding their annual summer prospect camp and this year's list of players is a mixed bag of newly drafted players, guys who have been with the organization for a while now and also a trio of un-drafted free agents. The team is expected to release the camp roster in the next day or so but The Pipeline Show was able to obtain a partial copy ahead of time. The Edmonton Oil Kings have made their two CHL Import Draft selections and have added a Czech defenceman and a Latvian forward to the team, the latter having been chosen by the Edmonton Oilers in the NHL Draft over the weekend. The two newest Oil Kings are blueliner Marek Hrbas and winger Kristians Pelss. GM Bob Green will join Guy Flaming on The Pipeline Show this evening to discuss the newest members of the organization. As talked about on the TEAM 1260 during the Saturday portion of the extensive 2010 NHL Draft coverage, the Prince George Cougars have selected Martin Marincin with the 1st overall pick in the CHL Import Draft. 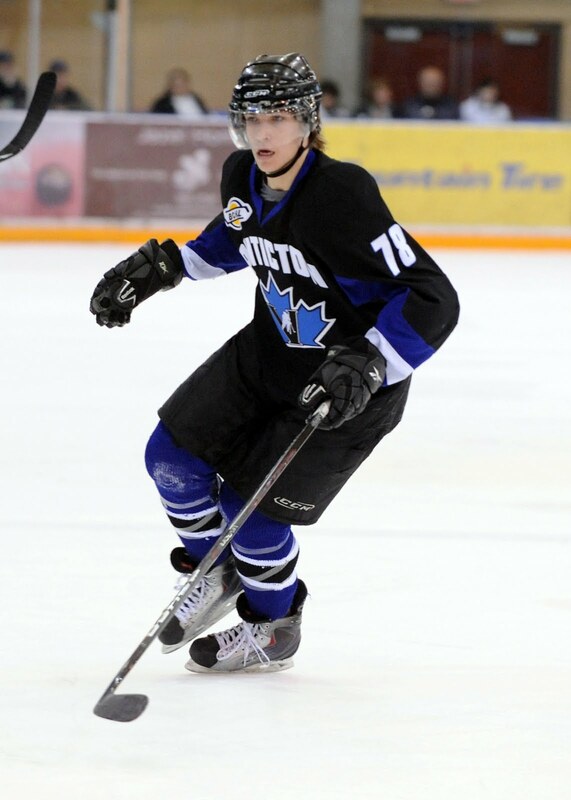 Marincin was chosen in the 2nd round, 46th overall, by the Edmonton Oilers who drafted a total of 11 players of which 7 will play in the WHL next season including the newest member of the Cougars. Well, our favourite time of the year has come and gone, as NHL teams have restocked the cupboard with fresh young faces, dreaming of playing in the NHL. How many of these kids will actually make it? Not a lot, but they'll all be given a chance. Here's some names that stick out for me. Only a few more hours now before we know who comes out on top, Tyler or Taylor. But there are so many other interesting stories in round one and beyond. The biggest wild card of the first round has to be Brett Connolly. He put up 30 goals as a 16 year old, but played only 16 games (putting up 19 points) because of a reoccurring hip injury. Scouts have told me if Connolly was healthy this year, he would be challenging Hall and Seguin for the top spot. So Connolly's potential is top 3, but his injury might drop him out of the top 5. Not the top 10 though. I'm told Florida has informed the Connolly camp they will be taking a defenceman, most likely Eric Gudbranson. Tampa Bay is calling the Prince George Cougars every hour it seems, trying to get a health update. Just in case he broke his hip getting out of the shower???? So the Lightning really like him. Atlanta didn't fly Connolly in for a visit, but the Minnesota Wild did, and have told the Prince George Cougar he won't get passed him if he's available. Meaning the free fall, if it happens, will end at 9. Kirill Kabanov was on with Neilson and Chase this morning on the TEAM 1260 live from LA. It was interesting that he said one of his former agents (he's on his 3rd this year) told him to leave Moncton for the Russian Under 18 team. I have it on good authority that his father is the one who advised him to do this. Dmitry Chesnekov of yahoosports.com joined TPS recently and said compared to Kabanov's fathers, Carl Lindros might be father of the year. Will Beau Bennett become a Predator. I know one of their scouts is pushing really hard for Nashville to take him. I guess we'll see what kind of influence he has. The scout has been able to suggest some gems in the past for Nashville. The Columbus Blue Jackets have been desperate for a centre for a long time. Today on Nielson and Chase, CBJ beat writer Aaron Portzline said Columbus might trade down. If so, would Portland's Ryan Johanssen be worth dropping down for? 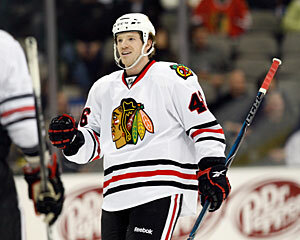 He finished 2nd on team scoring this year, and led them in post season points, putting up 2 more then Nino Niederriter. Johanssen has great vision and is a set up man with size. When he bulks up he could be a force with Rick Nash in a few years. Can't wait for it all to go down. Guy and I along with Corey Graham will be your hosts for The Pipeline Show Draft Day coverage, starting at 5 pm mst on the TEAM 1260 in Edmonton, where you can also listen online. It's the day that Oiler fans have been waiting for since April when the NHL Draft Lottery officially gave the franchise its first ever 1st overall daft pick. While the answer to Taylor vs Tyler will finally be decided tonight, some fans want to know who else the team might be coveting. As in years past, I've done by own due diligence and here are a smattering of names that I think will be of significance to the Edmonton Oilers. Does Tambellini have the stones to make a deal on the draft floor? When Kevin Lowe was G.M. of the Oilers he never seemed to have trouble making a quick decision on a deal. 2007 he moved up to take Riley Nash. He had no problem giving up a first round pick in 2006 to bring in Dwayne Roloson. The future of the Oilers certainly rests with whoever is drafted first overall today, but another big part of the future could depend on if current G.M. Steve Tambellini can make a quick decisison, something I'm told doesn't happen very often. 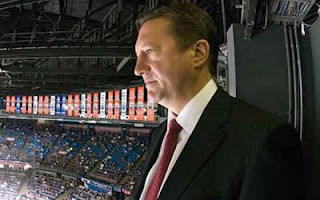 If team X calls up the Oilers and wants to deal a pick for a player, or other picks, and Tambellini has to make a call on the spot...can he do it? Past evidence that has been presented to me suggest no. From different sources across the league, here's what I've gathered from past deals the General Manager has and hasn't made. 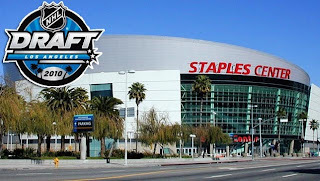 When we offered up the summary from the team-by-team 2010 draft previews last Saturday we mentioned that our official mock draft would come out in a few days. It's now the eve of the big day and so the time has come. The first thing you'll notice, if you compare our mock draft with the draft previews, is that a bunch of the names are in different order. Obviously, as we explained, that's because the draft previews were set in stone at the end of May and there have been a lot of changes and a lot of information since then. Because of that it just makes sense that our mock would reflect our opinions and interpretations for what they are today. 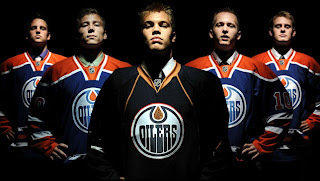 Fraser An Oiler-Are Nash and Pouliot on their way out? 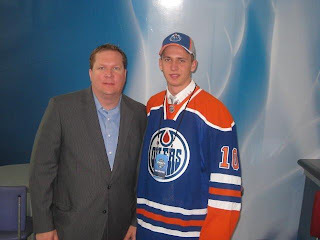 According to Bob Stauffer (Oilers radio network/Oilers lunch, 1-3 pm on The TEAM 1260) and Dan Tencer (Oilers radio network) Edmonton has picked up Colin Fraser for a 6th round pick. Which 6th round pick it is, I'm not sure as the team has 3 of them. As for Fraser, I watched him play when I worked in Red Deer. Then he was a Rebels top line 2 way centreman with some grit who played on one of the greatest World Junior team's ever, 2005 North Dakota. It likely helped that the head coach of team Canada was also the head coach in Red Deer...Brent Sutter. He's turned into a scrappy, smart, dependable player that can centre the 3rd or 4th line and win his fair share of draws, something the Oilers really lacked last year. He hasn't played a lot of playoff games in the last 2 years, but suited up quite a bit in the regular season. Fraser is a versatile player, but is still learning to hone is aggression and react at the proper times. The debate has raged on for months now, especially here in Edmonton where the local club has the ultimate say on who will go #1 at the 2010 NHL Entry Draft. The Edmonton Oilers will put a new face on their franchise on Friday in Los Angeles when they select either Taylor Hall of Tyler Seguin with the first overall pick. 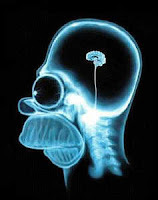 The argument has gained a considerable amount of steam beginning with the end of the NHL season, it picked up more when Plymouth and Windsor met in the OHL playoffs, ratcheted up another notch after the Memorial Cup and higher still over the last few weeks. It's no longer a friendly discussion anymore; if one fan voices his preference for either player there seems to be a gang of supporters ready to pounce in defence of their guy. I've been very public about what I would do and who I would select if I were in their position (Seguin) but I've also tried to be clear in stating that I don't think the Oilers can really make a mistake. That might sound like I'm on the fence - I'm not, I'd attempt to get something from Boston to lay off of Hall and take Seguin. But if Edmonton opts for Hall, and that seems to be the general consensus and what my own digging suggests, then I don't believe that choice is really an error. 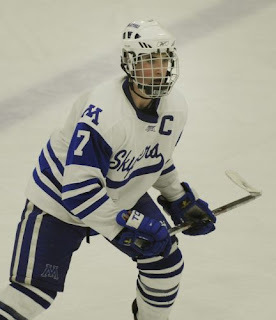 Each year The Pipeline Show is excited to bring you entries to our blog written by players in their draft year and 2009-10 is no exception. 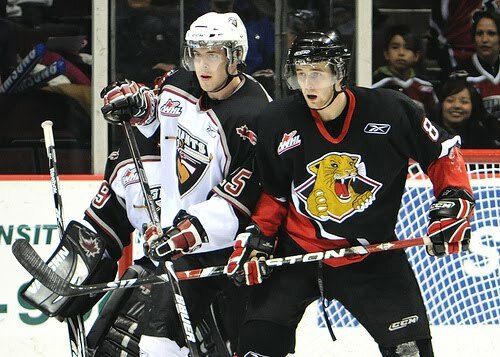 So far we've heard from Edmonton Oil Kings defenceman Mark Pysyk and Prince George Cougars forward Brett Connolly. Annual 2-Hour Draft Countdown... Tonight! Every year on The Pipeline Show we lead up to the NHL Draft with a 2-hour special that we call The Draft Countdown. In years past we've been joined by the head scout of ISS, Mike Oke, who takes a truckload of email or phone questions on that year's draft class. It's always our most downloaded show of the season and easily the one we get the most emails for. But... this year Mike Oke has moved on to become the Director of Player Personnel for the Peterborough Petes so ISS will not be a part of the annual special this time around. Dean and I discussed how we will tackle the big show this year, what we could do to make it better. 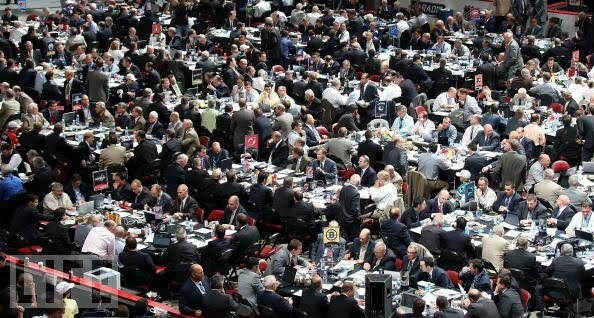 We thought it would be great if we could track down someone who has actually been on the draft floor, with a NHL team, has scouted the players from the perspective of a NHL team, has knowledge and experience in preparing a NHL scouting staff for the draft, has been involved on the draft day trades and has been on the podium announcing the pick for a NHL team. Oh, and he'd have to be available tonight for 2 hours. You have to respect the way the Flyers have resisted the urge to experiment with logo changes or alternate jerseys. This 3-D release is the biggest departure from the look that every hockey fan recognizes and it's obviously not a huge change at all. Philly has turned their crest into a brand and it's become one of the more recognizable ones in all of professional sports. The horse head gets a lot of ridicule around the league's various fan bases but I don't think that it's half as bad as some of the other crests that I've talked about over the last month. It's not great but at least it is a reflection of the city - Calgary is renowned for its stereotypical western heritage but there is still a lot of ranching in Southern Alberta and of course the Calgary Stampede is a huge attraction. The attempt may have fell short for many people but it's far from the worst we've seen plus the team made up for it with the current Flames jersey which was a massive hit with their fans. I've always wondered what people outside of North America thought when they saw the symbol of Canada, the maple leaf, not as it appears on our flag but instead... blue. The team's original maple leaf was green, which makes sense. Apparently there was talk in the mid-1920's about going red and white, also a sensible colour for a team with a maple leaf on it. Yet according to Wikipedia, which I'm told is always 100% accurate (/sarcasm font), the Leafs chose blue because "blue represents the Canadian skies". Unfortunately, the only time I've ever seen a blue leaf it was in the movie Avatar. For me, 'Red and Black' is the most overused colour scheme in pro sports. I always liked the original red and green look that New Jersey had although I'll admit, Christmas colours on a team called 'The Devils' is a bit of a miss match. Still, I do applaud the team for not tinkering with the actual crest design at all. Like Philadelphia, the Devils don't have an alternate logo although there are some creative fan-produced ones that can be found online. The Oilers alternate logo in the early years of the 21st century was created by Todd McFarlane, part team owner better known as the guy who revolutionized the comic book industry with his rendition of Spiderman and creation of Spawn. The sweater became one of the best selling 3rd jerseys of all time (might still be) and although traditionalists didn't like the departure from the original, there was a lot of thought put into the details of the logo. When McFarlane and the rest of the previous owners sold the team to Darryl Katz, the jersey was retired. I mentioned in the other Boston Preview (see the 15th overall write up) that the Bruins have a well known and beloved logo. They've altered it a few times and this is one of the efforts that fell short in the minds of most fans. The sweater design wasn't bad but the bear head, referred to many as the "Winnie-the-Pooh crest", seemed to lack the ferocity of the rest of the jersey. After several days of waiting, the Edmonton Oil Kings finally made it official on Friday as they confirmed that minor pro coach Derek Laxdal is stepping behind the bench at Rexall Place. Dean Millard reported back on Monday morning that Laxdal was the man for the job and that he was in the process of filling out his staff. There was no mention of any assistant coaches on Friday though. Here is the official release from the Oil Kings. I've already gone to lengths complaining that this alternate logo Florida unveiled this past year was a blatant ripoff of the Quinnipiac Bobcats so I won't do it again. Instead I offer my congratulations to the organization for the upgrade because it's better than what the team wears on a regular basis. Every week on The Pipeline Show Dean and I interview a player who is eligible for the next NHL Entry Draft. Even during the major event specials like the Frozen Four Coach's Show and Memorial Cup Coach's Show... we still reserve a segment to introduce these young NHL hopefuls to the masses. It's what we specialize in and we're pleased to have had "exclusive" interviews with most of the Top 50 ranked players for each of the last 3 or 4 years including 2010. Some weeks we'll substitute a scout from NHL Central Scouting or an independent agency, just for another perspective. We've had plenty of NHL scouts, NHL General Managers, CHL coaches, NCAA coaches and other media folks on as well and all have contributed to our coverage of the Class of 2010. There is just 1 edition of The Pipeline Show to go before the June 25/26th draft and you won't want to miss the June 22nd show. It's our annual 2-hour Draft Countdown special and this year has a new and exciting twist that we think you'll really appreciate. Until Tuesday, here's a recap of what we've done this year and who we've introduced fans to so far from the Draft Class of 2010. Speaking of monumental logo upgrades... thank you to the dude (or dudette) who clued in and punted the ridiculous bug that Columbus used to wear on their jerseys and decided to adapt the Civil War look. Not that war is exactly something you want to promote, but the nod back to the history of the region is a massive step up from "Stinger", their green (not blue!?) insect mascot that the team used to have on their uniforms. The current theme was a perfect fit for former coach Ken Hitchcock, a self-proclaimed civil war aficionado. One of the most openly hated logo changes of all time was when the Isles moved from their classic crest to the "Captain Highliner Fisherman" seen here. I'll be honest, back in the day I didn't think it was all that horrible but I hated the colour change that accompanied it. It wasn't until the team went retro and brought back the classic uniforms that I realized how bad the version from the mid-90's actually was. With the news that Rob Daum is not having his contract renewed by the Edmonton Oilers, it now leaves 4 coaching vacancies by my count. Rochester, Oklahoma City, Manitoba, Hamilton. You will likely be able to add Rockford to the list in the next little while. I've been told Ice Hog Head coach Bill Peters could join the Florida Panthers as an Assistant Coach, and might have the same opportunity in Chicago if John Torchetti is named Head Coach in Atlanta. Here's an interesting fact. Torchetti was once an assistant coach in Greensboro of the ECHL while Davis Payne and Dan Bylsma were playing. If Torchetti gets the bench boss gig in Atlanta it will prove that all 3 have climbed the ladder fairly well. How much does Torchetti love coaching? Word is he wasn't making a lot of money while coaching in Greensboro, so he took another job driving cab to makes ends meet. That's passion and I hope he gets his shot. Word around the WHL campfire is that Derek Laxdal has taken the Oil Kings coaching job in Edmonton. My source tells me that Laxdal is in the process of hiring assistant coaches and that former Spruce Grove Saint bench boss Steve Hamilton (who was in the running for the head coach job as well) is at the top of the list. If Laxdal hasn't been hired, it seems strange that he would be mulling over candiates given to him by the team. I thought Laxdal was going to get some consideration for one of the 3 (and soon to be more) vacant AHL jobs, and maybe he would have if he hadn't accepted the Oil Kings gig, but working for a WHL team owned by an NHL team, that has some prized prospects Coming Down the Pipe is hard to turn down. 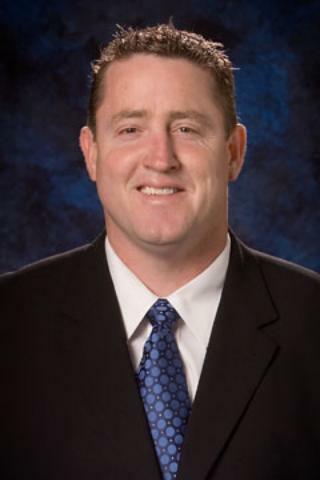 The former Brandon Wheat King led Idaho to 48 wins last year and a ECHL title in 2007. He also was named the league's top coach last season. The job he is leaving is a good one, but the stability of the franchise is in question. There has been no announcement yet from the Oil Kings. I will have some more coaching news and nuggets later on, but for now it's time to play some golf...if the rain stays away. We'll talk this subject and much more tonight from 7-9 pm mst on the TEAM 1260, or online here where you can also find a complete guest list for tonight's show. There's a reason why I like this choice of alternate look that Tampa went with. I couldn't place my finger on it at first, normally I find simple script to be a little too... simple. 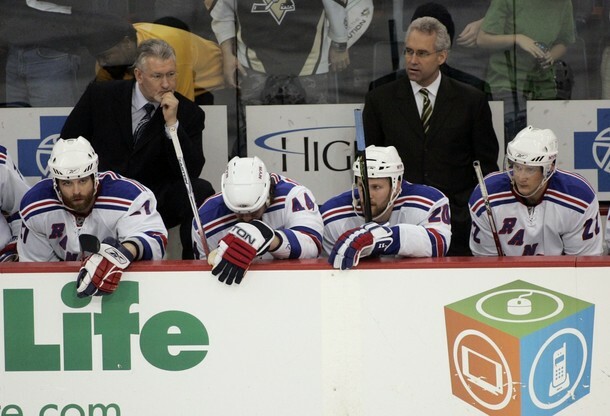 When Colorado or Pittsburgh did it, or even the Rangers, I found it boring and lacking in imagination. Not that this is overly creative but it is different in one sense; it's not the team's name but rather its nickname. It's like Montreal using 'Habs' or Toronto opting for 'Buds'. Choosing 'Bolts' is unique and I like that. "Hurricanes" is a great name for a sports team because it immediately draws to mind the image of an unstoppable force of power, something mortal man can't hope to control. Unfortunately, I don't think I've ever seen a logo for a team with that name (or Tornadoes, Cyclones, Twisters, etc) that was decent. The Lethbridge Hurricanes tried adapting the Tasmanian Devil to theirs a few years ago and that was weak too. However, not as lame as the logo the NHL team uses regularly or this alternate. I know it's a meteorological symbol or something... but that's plain and boring and has nothing to do with hockey. The name fits geographically, I get that, but you're marketing team is screwed trying to tie it into the sport. Might as well call them the Carolina Big Mouth Bass... it makes as much sense and then you could have a fish chomping through a stick. Like San Jose. I'm assuming it's representing a bird, the basic shape is there, but it still looks like the Mercedes emblem in a dress to me. Does a non-hockey fan look at this and have any idea what this logo is representing? What about this says Atlanta (if there is something, please educated me)? It's not without any redeeming qualities though; it's colourful. It could work I guess as long as the team doesn't one day decide to start wearing jerseys with their name down one arm while the other one is a different colour. What? Oh... forget it. Hey it's not breaking any new ground in terms of creativity but using the silhouette of the State with the catchy slogan makes for a decent shoulder patch. If Detroit can claim to be "Hockey Town" than I see no reason that Minnesota can't lay claim to being "The State of Hockey". In fact with the rich tradition of the sport at all levels I can't think of another area of the U.S. more deserving of the moniker. Hockey Canada announced the training camp invitees for it's U20 team and U18 team this week. Take a look, any surprise omissions or additions? We'll be speaking with one of the U20 invitees this Tuesday, a player who is also draft eligible for 2010, as Ryan Johansen of the Portland Winterhawks will join us. Probably my (Guy's) personal favourite logo update from a few years ago, including the Statue of Liberty was a great idea that made it more representative of the city. The shield outline is still present tying it back to the classic logo so traditionalists didn't seem to have much of a problem with the new look either. Probably the most successful re-imagining of the Original Six crests. I get it. A constellation of a bull ties in both celestial stars as well as the State's cattle industry and it makes perfect sense... in theory . Unfortunately, on paper, it's a constellation of the female reproductive system. The simple Texas State outline shoulder patch the team currently uses is much more appealing. I haven't been much of a fan of the various Ducks uniforms since their inception but in my opinion, the best one they unveiled was the purple/black/grey version. It's the only one that didn't have some sort of Duck motif; no webbed foot, no duck bill but it looked like a hockey sweater as opposed to the current jersey. So a 19 year old gets into a bar fight and leaves his opponent with a chipped tooth and a bleeding mouth. Normally it wouldn't' be that big of news, but that 19 year old is 13th overall draft pick in 2008 and a Memorial Cup champion Zack Kassian. Now it appears the incident at a Windsor night club may be giving the Buffalo Sabres second thoughts on signing him. I highly doubt this will make the Sabres bail on Kassian all together, unless there is more to the story. One person I know described this as "Phoenix's Roadkill Logo". When people can say that about your team's crest... that's not so good. I've also seen message board comments that suggest it might be bacon, but that's insulting to one of mankind's greatest culinary achievements. Suffice to say that this disgraceful piece of artwork has been scrapped and should forever remain in the trash where it belongs. When all the teams trotted out their new alternate jerseys a few years ago, the St. Louis Blues were one of the clubs that were applauded for their new look. The logo here was a great creation that didn't erase the music note but instead added a famous city landmark. For me it's one of the rare logo changes that might actually be an improvement on the original. I don't know that it is, but it's an argument I'd at least be willing to hear. It appears that the Edmonton Oil Kings vacant head coaching job is Perry Pearn's to turn down. Pearn was supposed to join TPS Tuesday night, but travel plans changed and he wasn't able to guest on the show. He did, through text message, tell us he does have interest in the job, the The Pipeline Show has learned from several sources that if Pearn wants the job, he has it. Troy Hesketh Out 4-5 Months? 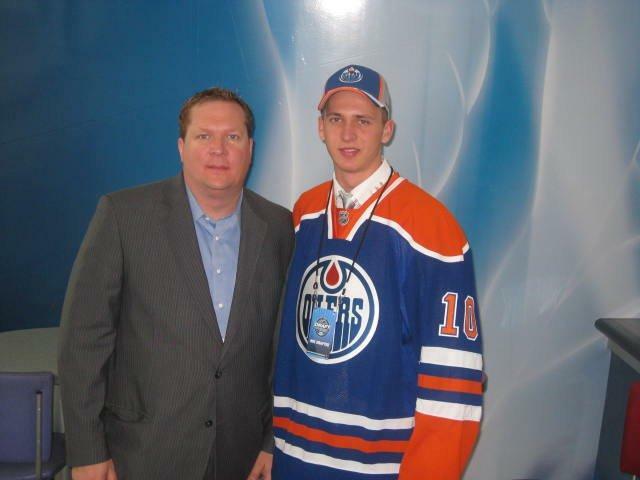 According to a couple of different sources, Edmonton Oilers 2009 3rd round pick (71st overall) Troy Hesketh has a torn labrum in his shoulder and could miss the next 4-5 months with surgery and rehab. Both "Fargo Force Blog" and "Sixty Minutes. No Alibis. No Regrets" are reporting that the promising defenceman may opt for surgery and if so, he'll be out until about November. Hesketh is expected to join the USHL's Fargo Force but he'll miss the first 10 games or so if he has surgery in the near future. 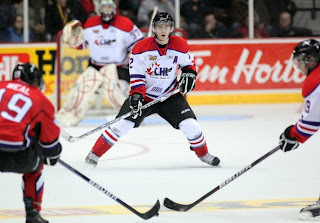 The Edmonton Oilers are holding their annual summer prospect camp from July 5-9th and Hesketh was expected to be there. This may change that or just provide the Oilers with an opportunity to evaluate the shoulder with their own medical staff. Of the Original Six teams, I think Boston has had the most variety in their logo. I could be wrong but it seems that way to me. The classic B is as much an iconic symbol of hockey as Detroit's winged-wheel or Montreal's 'C'. That didn't stop the team from bringing out the "Winnie the Pooh" crest a few years back and then bringing on this one, an updated tribute to a really, really old Bruins crest. It's sharp but I wouldn't want it to replace the 'B' by any stretch of the imagination. Well, so much for Russian NHL draft prospect Kirill Kabanov cleaning up his act. Top agent J.P. Barry of CAA, who had been helping Kabanov rehabilitate his image in recent weeks, told The Hockey News that he won’t be representing the player any longer. I don't know what it is about this logo but to me it's terrific. Maybe it's the simplicity or the way the parliament building is used. It certainly says "Ottawa" and "Canada's Capital City" a lot better than a Roman general... or Spartan... or whatever the soldier is. I get the tie-in to him being a government official but he's not very Canadian is he? After the stunning news that Hamilton Bulldogs head coach Guy Boucher said no to the Columbus Blue Jackets bench boss, word is that Manitoba Moose head coach Scott Arniel has taken the job. 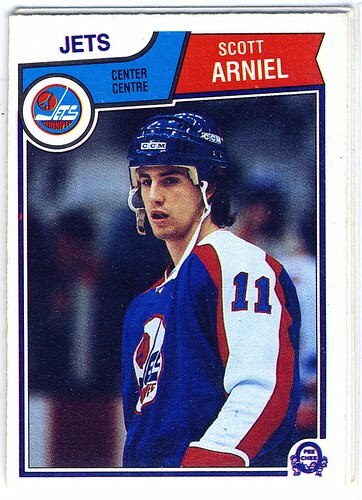 I'm happy for Arniel, who is a former Winnipeg Jet and has done a great job with the Manitoba Moose the past 4 years taking them to the Calder Cup and being named AHL coach of the year in 2009. His teams in Winnipeg were always top 3 in goals against without sacrificing offence. Is Daum OK for OK City? 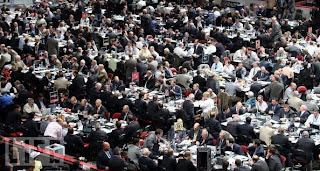 Last year the Oilers scouting staff went to the draft without contracts for the next season which was considered poor etiquette by people in the NHL that I spoke with about it. But July 1st is the start of all new contracts in the NHL and once again there are a couple important parts of the Oilers organization that aren't sure yet if they're part of the big picture moving forward. This year it's the minor league coaching staff. 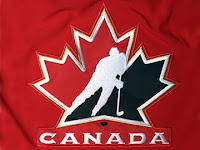 Team Canada has named it's coaching staff for the 2011 World Junior Championship. You can find the official release here. 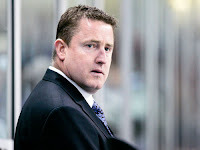 Dave Cameron coaches the Memorial Cup host Mississauga St. Michaels Majors and has paid his dues with Hockey Canada holding Assistant and Associate coaching jobs the past 2 years. Joining Cameron on the bench will be Bob Boughner of the 2 time defending Memorial Cup champion Windsor Spitfires, Ryan Huska of the Kelowna Rockets and Andre Tourigny of the Rouyn-Noranda Huskies. The 2011 World Junior Championship will be held in Buffalo this December. Their most recent third jerseys can be found on the cool spectrum listed somewhere between 'fugly' and 'really fugly' but thankfully the simple Big Foot shoulder patch is a winner. But Big Foot is more of a Pacific Northwest kind of creature isn't he? Perhaps this is a Abominable Snowman foot... not that Denver is in the Himalayas or anything. Whatever, it's still better than the blue third jersey isn't it? A lot of people really hated the mustard jerseys that Nashville brought out a while back but I'm in the minority group that actually didn't mind the change. I still like this version of the big cat better than the skeletal one I've seen out there. I can understand why the mustard was rejected by so many but you have to admit, they stood out for being unique. 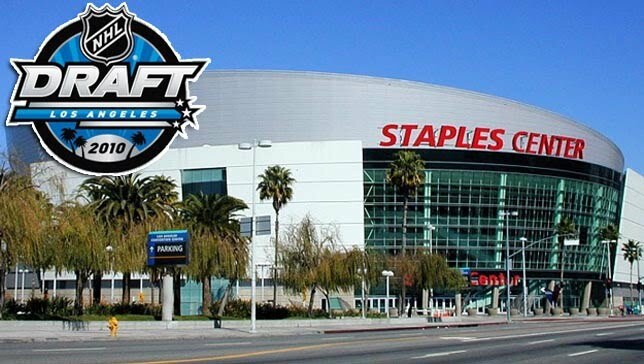 The Memorial Cup is over, the NHL Combine has come and gone, the Frozen Four is a distant memory... all that's left for this year is the NHL Entry Draft. For The Pipeline Show, this is our biggest month of the year, it's what we gear up for all season and it culminates on June 25/26th. Dean and I are once again hosting the live draft coverage on the TEAM 1260 and as the days get closer, more and more stuff bounces around my cranium. There were some God-awful third jerseys in the mid-90's and the Kings had one of them. This logo on it's own actually looks pretty cool and I think it could still be used to make a sharp looking uniform. Unfortunately, this handsome monarch was placed high on the left chest with a ridiculous looking grey/silver/black swoop resembling a beauty pageant sash coming off the right shoulder. Logo good - sweater fugly. 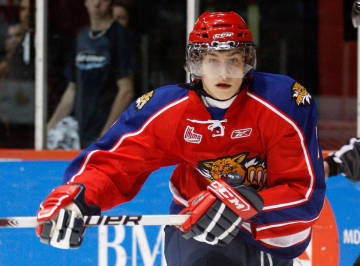 Olivier Roy to be Traded at Draft?